Dr. Ali Sepehr explains how his rhinoplasty patients can often benefit from a chin implant as well. 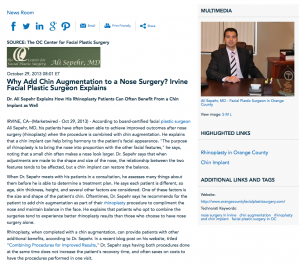 Irvine, CA — According to board-certified facial plastic surgeon Ali Sepehr, MD, his patients have often been able to achieve improved outcomes after nose surgery (rhinoplasty) when the procedure is combined with chin augmentation. He explains that a chin implant can help bring harmony to the patient’s facial appearance. “The purpose of rhinoplasty is to bring the nose into proportion with the other facial features,” he says, noting that a small chin often makes a nose look larger. Dr. Sepehr says that when adjustments are made to the shape and size of the nose, the relationship between the two features tends to be affected, but a chin implant can restore the balance. When Dr. Sepehr meets with his patients in a consultation, he assesses many things about them before he is able to determine a treatment plan. He says each patient is different, so age, skin thickness, height, and several other factors are considered. One of these factors is the size and shape of the patient’s chin. Oftentimes, Dr. Sepehr says he recommends for the patient to add chin augmentation as part of their rhinoplasty procedure to compliment the nose and maintain balance in the face. He explains that patients who opt to combine the surgeries tend to experience better rhinoplasty results than those who choose to have nose surgery alone. Rhinoplasty, when completed with a chin augmentation, can provide patients with other additional benefits, according to Dr. Sepehr. In a recent blog post on his website, titled “Combining Procedures for Improved Results,” Dr. Sepehr says having both procedures done at the same time does not increase the patient’s recovery time, and often saves on costs to have the procedures performed in one visit. Dr. Sepehr says it can sometimes make sense for patients to elect to have certain procedures at the same time in order to combine healing periods. Other than adding a chin implant to a rhinoplasty procedure, Dr. Sepehr says he might also recommend combination treatments for other cosmetic enhancement options – such as dermal fillers to compliment a lower eyelid surgery. He says the dermal fillers can help patients who are experiencing a hollowing effect or loss of volume in their cheeks. Dr. Sepehr also tends to recommend a brow lift to patients seeking upper eyelid surgery (blepharoplasty). He explains that when patients have sagging, drooping, and hooding skin above their eyes, adding a brow lift to a blepharoplasty results in improved outcomes for many patients. When considering facial plastic surgery, the Orange County surgeon says it is important to discuss your goals and ask any questions you may have with your doctor in a consultation. In this initial meeting, Dr. Sepehr says you and your surgeon can decide the best approach for achieving your aesthetic goals, and assess whether or not combining multiple procedures might be beneficial. Dr. Ali Sepehr is a fellowship-trained, board-certified facial plastic surgeon. He is a graduate of the University of California, Los Angeles School of Medicine, and is a member of the American Academy of Facial Plastic and Reconstructive Surgery. Dr. Sepehr works closely with medical students, fellows, and residents from University of California, Irvine Medical Center, passing on his knowledge as a facial plastic surgeon. He has also authored several chapters in medical textbooks, and has had his work published in scientific journals. Dr. Sepehr is available for interview upon request. For more information on Dr. Sepehr and his practice, please visit orangecountyfacialplasticsurgery.com or facebook.com/ocfacialplastics.